The Principal of a school decided one day to check the progress of the pre-primary class. He made a surprise visit and asked the class teacher to sit in the teacher’s room. When the class teacher left the class, every student had given a blank paper and a pencil. Then the principal told the students to write A to Z on the given paper in 10 minutes. After 10 minutes everybody was told to stop writing. The principal stood up to collect the papers from the students. The first student was able to write the up to Q and after that he had written only Q many times. Another student was stuck on W. someone was on G, someone was on J and so on. The Principal was amazed. He collected all the papers wrote the student’s name on the back side of the paper. Then he asked a student, why you have not written the next letter after Q. The student replied, whenever I write A to Z, I get a red circle on the letter Q and then I have to keep writing the Q many times until it’s a perfect Q. He asked another student who stuck on W, it was the same story. The Principal smiled and gave them another paper. He told all the students that this time only 5 minutes will be given to write the A to Z and no red circles will be mark if any alphabet is not written perfectly. The students were very happy. Everybody completed the A to Z and the inspection was over. The principal then called the class teacher in his office. He said, each and every student of your class completed the ABCD. The class teacher was happy. But there is a problem; I have forgotten to write the name of the student on his paper. The class teacher saw the first paper and he saw the letter Q. Immediately he told, this must be of Rohan. The principal said how you knew that. He said he never write the Q properly. Then the principal wrote Rohan on the corner of the paper. He said check the other also. The class teacher told the W is not perfect so this can be of Kartik only. The J is not perfect means it is of Ravi and so on. He wrote all the names one by one. The Principal then asked him to turn the page. Every page had a name of the student in the back side. The class teacher was puzzled. He asked the principal, sir if you have already written the name of the students behind the paper, why have you asked me to recognize the papers? The Principal then showed him the paper of the 1st trial. The class teacher was shocked to see it. He asked the principal why the students done like this. The principal replied, they don’t like the red circle you put on the alphabet and they have the habit to stick on the imperfect letter and repeat it until it is perfectly written. Now tell me one thing, how did you recognize the student from their paper. The class teacher replied by their imperfect letters. The principal replied that, the imperfection is the identity of each and every student. In fact, its may be imperfect your way but for now it is his style of writing. And there is no problem in any type of Q until it can be read as Q. Even my Q is not as perfect as per your perfect Q. Its good to teach perfection but it is very dangerous to stick on the imperfection. The class teacher realized the mistake. Like the story above, we also stick on the imperfections. We have made a certain definition of the Perfect and we want it that way only. We can’t accept the thing out of our way. We just don’t like it and our life stick there. Most of our struggles begin because we want something our way, the perfect way. We do this with people also. We want them our way. Either they have to change themselves or we will not like them. We can’t accept them as they are. We should understand that everybody can’t be like ourselves and life will be very boring if everybody is the same. Everywhere you go you meet the same person. Do we really like that? What we call the imperfection is their identity, their own way. It is perfectly okay to be imperfect in something. Nobody is perfect in everything. Many times we are that much behind making something perfectly our own way that we can not enjoy the things which is already perfect. We simply miss them. We should stop running in making everything perfect and learn to enjoy the imperfections also. This is only possible when we stop thinking in terms of should be and should not be. 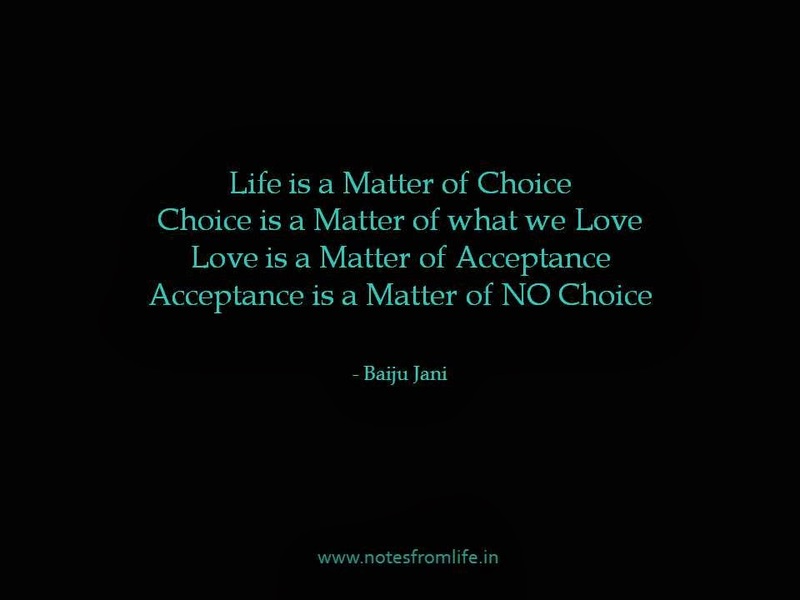 Let’s learn to accept the things, the way they are. Life never gives everything in our way because life has its own way. 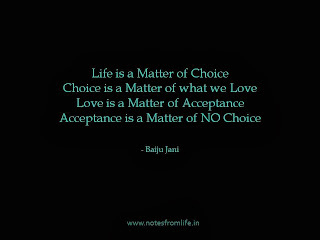 Let’s learn to live in the suchness of life. The Buddha called it Tathata. જેવો હું છું, એવો તો બસ તુજ ને જ મળું છું. પણ જેને મળવું કહેવાય, એવો તો બસ તુજને જ મળું છું. જેને મળવું કહેવાય, એવો તો બસ તુજને જ મળું છું. પણ કોઈની યાદમાં આંખ ભીંજાય, એ ખરાબ નહીં. પણ જે મળવા માટે મજબુર કરે, એ યાદ ખરાબ નહીં. પણ જે શબ્દોથી કહી જ ન શકાય, એ લાગણીઓ ખરાબ નહીં. પણ જે બે દીલને ભરી દે, એવું મૌન ખરાબ નહીં. 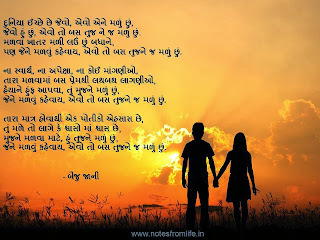 પણ જે યાદોને ભીંજવી જાય, એ વિદાય ખરાબ નહીં. 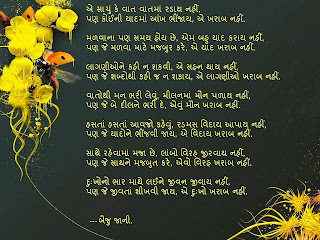 પણ જે સાથને મજબુત કરે, એવો વિરહ ખરાબ નહીં. પણ જે જીવતાં શીખવી જાય, એ દુઃખો ખરાબ નહીં. 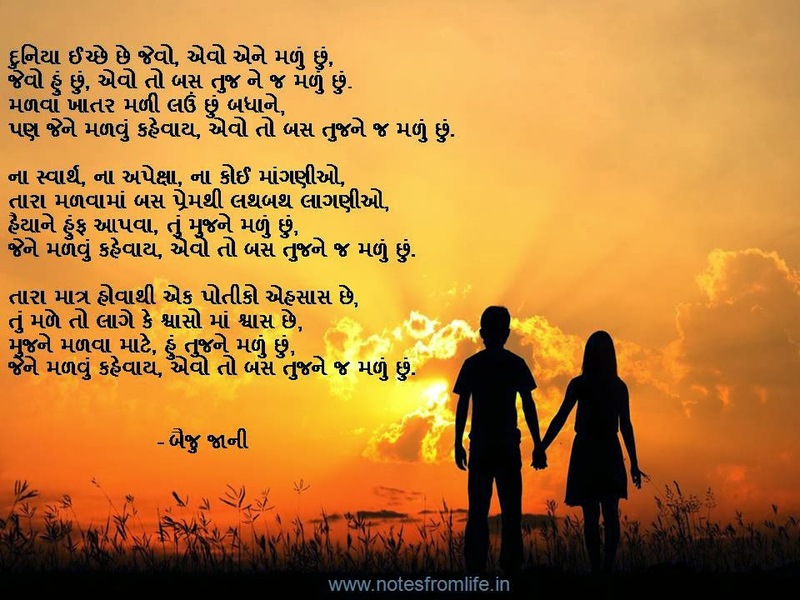 તું ઝલક દેતો રહ્યો, હું શોધમાં ફરતો રહ્યો. 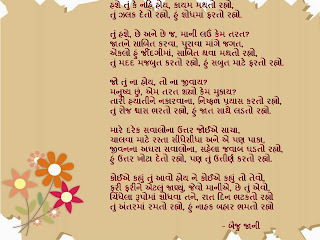 તું હશે, છે અને છે જ, માની લઉં કેમ તરત? તું મદદ મજબુત કરતો રહ્યો, હું સબુત માટે ફરતો રહ્યો. 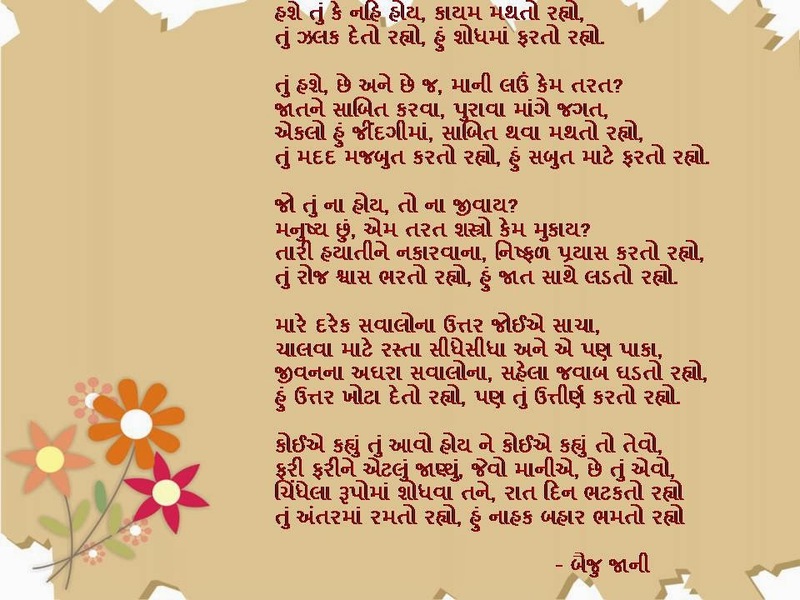 જો તું ના હોય, તો ના જીવાય? મનુષ્ય છું, એમ તરત શસ્ત્રો કેમ મુકાય? તું રોજ શ્વાસ ભરતો રહ્યો, હું જાત સાથે લડતો રહ્યો. હું ઉત્તર ખોટા દેતો રહ્યો, પણ તું ઉત્તીર્ણ કરતો રહ્યો.